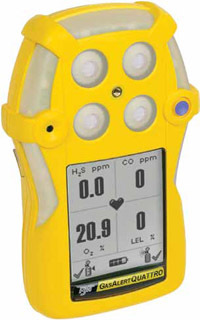 BW GasAlertQuattro Multi-gas portable gas detector Rechargeable Version for 0-1000 ppm CO (CARBON MONOXIDE). Combines a comprehensive range of features with simple one-button operation. Rugged and reliable, the GasAlertQuattro four-gas detector combines a comprehensive range of features with simple one-button operation. With flexible power options, the GasAlertQuattro is always ready. The graphic LCD displays easy to identify icons that indicate operational information, such as bump test and calibration status for simplified onsite auditing. IntelliFlash provides continuous visual confirmation of detector operation and compliance. Suited to a wide range of industrial applications including confined space entry, the GasAlertQuattro is fully compatible with BW�s MicroDock II automatic test and calibration system. 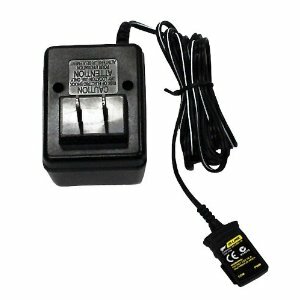 SR-M04-SC Replacement Carbon Monoxide (CO) sensor for GasAlertQuattro ..
GA-PA-1-MC5-NA Multi-unit power adaptor for GasAlertQuattro. ..
GA-PA-3 12-24 VDC direct-wire power adaptor for GasAlertQuattro ..
QT-BAT-A01 Alkaline battery pack with batteries- yellow for GasAlertQuattro. ..
QT-BAT-R01 Rechargeable battery pack - yellow for GasAlertQuattro. 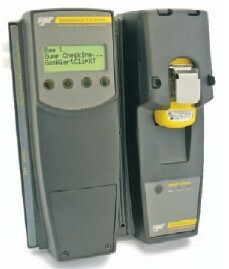 ..
QT-C01-MC5 Multi-unit (five) cradle charger for GasAlertQuattro. ..
QT-CK-CC Carrying case for GasAlertQuattro with foam insert. 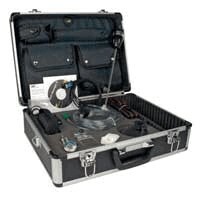 ..
QT-CK-DL GasAlertQuattro deluxe confined space kit for GasAlertQuattro detector. Detector, calibration gas and motorized sampling pump sold separately. ..
GA-PA-1-NA Replacement power adaptor for GasAlertQuattro ..
GA-VPA-1 12-24 VDC vehicle power adaptor for GasAlertQuattro and GasAlertMax XT II ..
GA-USB1-IR USB IR connectivity kit with Soft Tools for software GasAlertQuattro, GasAlertMicroClip XT/XL and GasAlertMax XT II with Fleet Manager II software ..
DOCK2-2-1C1N-00-G MicroDock II automatic test and calibration system. Base station with GasAlertQuattro docking module and charging cable. ..
DOCK2-2-1N-00-G MicroDock II automatic test and calibration system. Base station with GasAlertQuattro docking module. ..
> GAS DETECTORS (PORTABLE) > MULTI-GAS REMOVABLE BATT : 21 Items found. BW GasAlertQuattro Multi-gas portable gas detector Alkaline Version for 0-1000 ppm CO (CARBON MONOXIDE). Combines a comprehensive range of features with simple one-button operation. BW GasAlertQuattro Multi-gas portable gas detector Alkaline Version for 0-30.0% O2 (OXYGEN). Combines a comprehensive range of features with simple one-button operation. BW GasAlertQuattro Multi-gas portable gas detector Alkaline Version for 0-200 ppm H2S (HYDROGEN SULFIDE). Combines a comprehensive range of features with simple one-button operation. BW GasAlertQuattro Multi-gas portable gas detector Alkaline Version for 0-30.0% O2 (Oxygen), 0-1000 ppm CO (Carbon Monoxide). Combines a comprehensive range of features with simple one-button operation. BW GasAlertQuattro Multi-gas portable gas detector Alkaline Version for combustible 0-100% LEL (Lower Explosive Limit) , 0-30.0% O2 (Oxygen). Combines a comprehensive range of features with simple one-button operation. BW GasAlertQuattro Multi-gas portable gas detector Alkaline Version for 0-200 ppm H2S (Hydrogen Sulfide), 0-1000 ppm CO (Carbon Monoxide). Combines a comprehensive range of features with simple one-button operation. BW GasAlertQuattro Multi-gas portable gas detector Alkaline Version for 0-30.0% O2 (Oxygen), 0-200 ppm H2S (Hydrogen Sulfide). Combines a comprehensive range of features with simple one-button operation. BW GasAlertQuattro Multi-gas portable gas detector Rechargeable Version for 0-30.0% O2 (OXYGEN). Combines a comprehensive range of features with simple one-button operation. BW GasAlertQuattro Multi-gas portable gas detector Rechargeable Version for 0-200 ppm H2S (HYDROGEN SULFIDE). Combines a comprehensive range of features with simple one-button operation. BW GasAlertQuattro Multi-gas portable gas detector Alkaline Version for 0-30.0% O2 (Oxygen), 0-200 ppm H2S (Hydrogen Sulfide), 0-1000 ppm CO (Carbon Monoxide). Combines a comprehensive range of features with simple one-button operation. BW GasAlertQuattro Multi-gas portable gas detector Alkaline Version for combustible 0-100% LEL (Lower Explosive Limit) , 0-30.0% O2 (Oxygen), 0-1000 ppm CO (Carbon Monoxide). Combines a comprehensive range of features with simple one-button operation. BW GasAlertQuattro Multi-gas portable gas detector Alkaline Version for combustible 0-100% LEL (Lower Explosive Limit) , 0-30.0% O2 (Oxygen), 0-200 ppm H2S (Hydrogen Sulfide). Combines a comprehensive range of features with simple one-button operation. BW GasAlertQuattro Multi-gas portable gas detector Rechargeable Version for 0-30.0% O2 (Oxygen), 0-1000 ppm CO (Carbon Monoxide). Combines a comprehensive range of features with simple one-button operation. BW GasAlertQuattro Multi-gas portable gas detector Rechargeable Version for 0-30.0% O2 (Oxygen), 0-200 ppm H2S (Hydrogen Sulfide). Combines a comprehensive range of features with simple one-button operation. BW GasAlertQuattro Multi-gas portable gas detector Rechargeable Version for combustible 0-100% LEL (Lower Explosive Limit) , 0-30.0% O2 (Oxygen). Combines a comprehensive range of features with simple one-button operation. BW GasAlertQuattro Multi-gas portable gas detector Rechargeable Version for 0-200 ppm H2S (Hydrogen Sulfide), 0-1000 ppm CO (Carbon Monoxide). Combines a comprehensive range of features with simple one-button operation. BW GasAlertQuattro Multi-gas portable gas detector Alkaline Version for combustible 0-100% LEL (Lower Explosive Limit) , 0-30.0% O2 (Oxygen), 0-200 ppm H2S (Hydrogen Sulfide), 0-1000 ppm CO (Carbon Monoxide). Combines a comprehensive range of features with simple one-button operation. BW GasAlertQuattro Multi-gas portable gas detector Rechargeable Version for combustible 0-100% LEL (Lower Explosive Limit) , 0-30.0% O2 (Oxygen), 0-200 ppm H2S (Hydrogen Sulfide). Combines a comprehensive range of features with simple one-button operation. BW GasAlertQuattro Multi-gas portable gas detector Rechargeable Version for combustible 0-100% LEL (Lower Explosive Limit) , 0-30.0% O2 (Oxygen), 0-1000 ppm CO (Carbon Monoxide). Combines a comprehensive range of features with simple one-button operation. BW GasAlertQuattro Multi-gas portable gas detector Rechargeable Version for 0-30.0% O2 (Oxygen), 0-200 ppm H2S (Hydrogen Sulfide), 0-1000 ppm CO (Carbon Monoxide). 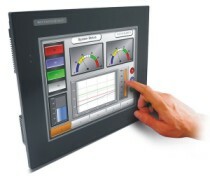 Combines a comprehensive range of features with simple one-button operation.